This dish certainly hit the spot. Fresh tasting and delicious flavours. Docaitta note: This recipe can be grilled as well as pan seared, so it can be part of your barbecue repertoire or done inside any time of the year. See below for other pairings for the salsa fresca. 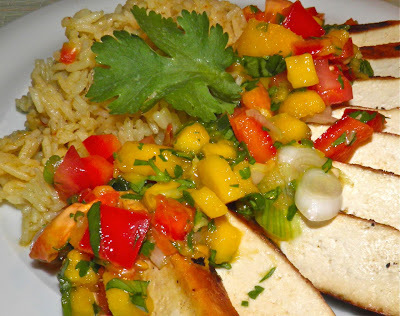 Here’s a dish that will satisfy your hungriest vegetarians, or even those who aren’t – vegetarians that is... It's a great way to welcome non-carnivores over for a fantastic meal. Tofu is a strange thing. People either love it or hate it. I believe that's because of the "blandness" it often has as opposed to a dislike of the flavour, because it has very little of its own. If you’re searing or grilling, the trick is to impart as much flavour as possible before you cook it. Luckily, since it has little distinctive flavour of its own that job is easily accomplished. Most seared or grilled tofu recipes will use a marinade. My marinade has garlic and soy as its main flavours. The 2 hour marinating time is to ensure that the tofu is well permeated. You can certainly try other combinations to flavour tofu. If desired you could use ginger, five spice powder, fish sauce, oyster sauce, etc. It’s quite easy to tailor your tofu flavour to complement whatever else you are serving. This “salsa fresca” has the traditional two peppers/tomato/onion combo, but adds mango and a hint of fish sauce and lime to swing it to more Thai flavours. Let the salsa sit for about 1/2 hour before serving. This was good. Even if you think you don’t like tofu you should try this. It is said that we eat with our eyes first. If so, this recipe is two meals. And now I have to buy a barbecue. Sigh. 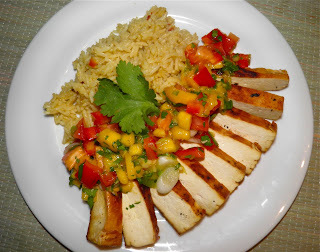 The salsa would be equally tasty served with grilled or broiled chicken or firm white fish such as halibut. the steaks can be grilled. Chop the garlic and place it in a baking dish with the soy sauce and oil. Whisk with a fork. Nestle the steaks into the marinade. Pierce the top of each steak with the tines of a fork. 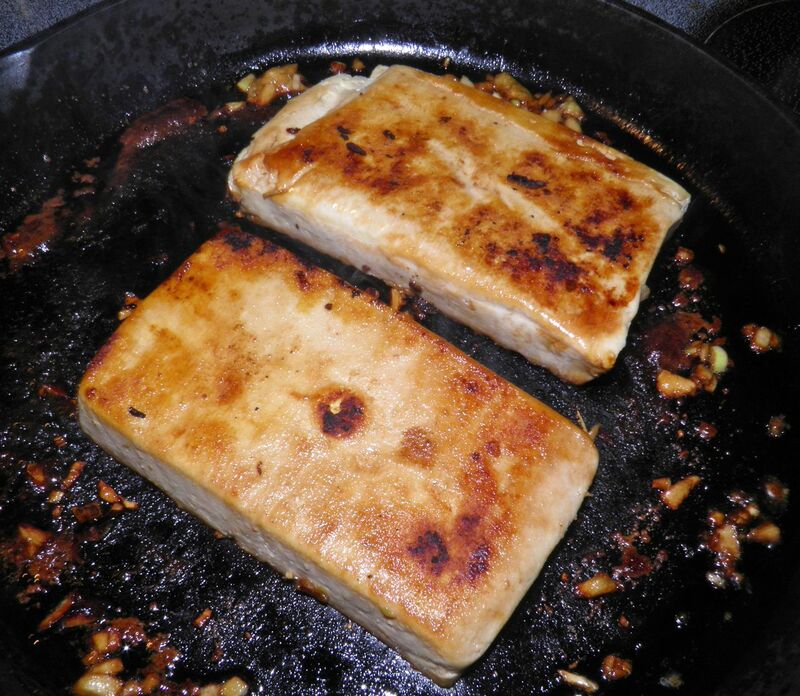 Flip the tofu over so the pierced side faces down into the marinade. 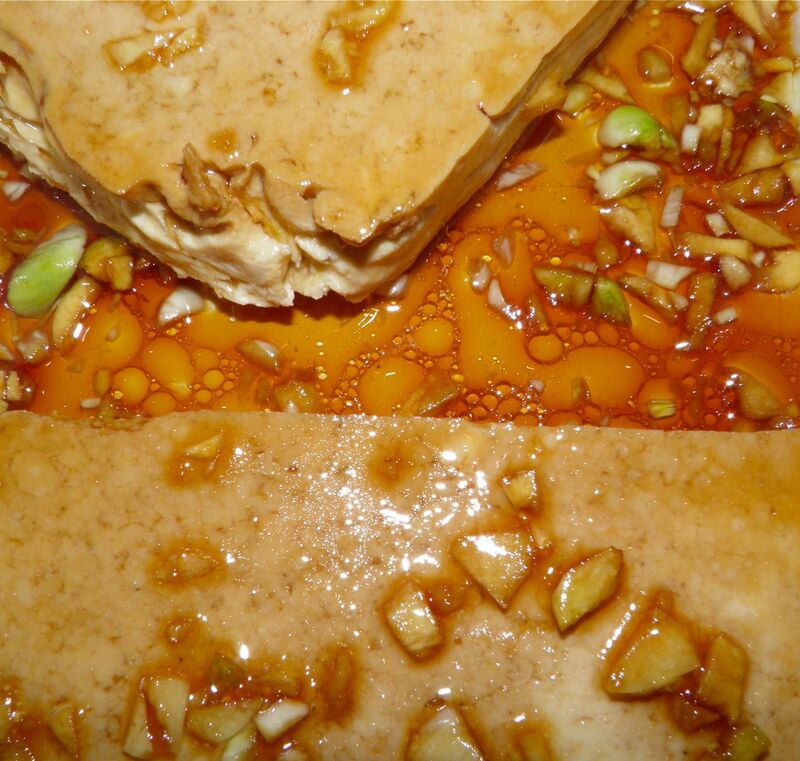 Cover the tofu with plastic wrap and let marinate for 1/2 hour on the counter. Uncover, pierce the top side of each steak and flip. Cover and marinate for another 1/2 hour, then flip again. Plated and ready for guests. Marinate the steaks for a further 1 hour, flipping once more. Total marinating time is 2 hours with 4 flips. While the tofu is marinating make the salsa. Cut the flesh of the mango into 1/4 inch dice and place in a non-reactive bowl (glass, ceramic, plastic). Chop the tomato into similar size. Seed and chop the red pepper to similar size. Repeat with the jalapeno, but chop the flesh very finely. Add to the mango. Chop the green onions in thin rings. 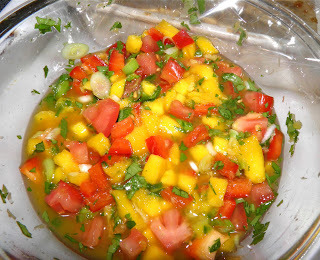 Add them, with the fish sauce, chopped cilantro and lime juice to the mango mixture. Toss well to mix. 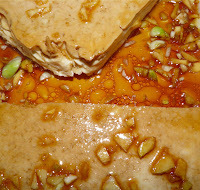 Cover with plastic wrap and let sit to combine flavours. After the tofu has marinated, pour the marinating liquid into a frying pan large enough to accommodate all four steaks. Heat the pan until the garlic begins to sizzle. Add the steaks to the pan and let fry until browned on each side. This should take about 6-7 minutes per side on medium high heat. To serve, slice each tofu steak and arrange in a fan – or other artful arrangement – on the plate. Place some hot coconut rice across from the tofu slices and spoon 1/4 of the salsa down the centre of the plate and on the tofu slices. Decorate with a cilantro sprig if desired.